Having been given a fig. Tonight I walked to my first chamber music concert of the term (the University just started up again this week), and not only was it still light out but the sun was even up for my whole walk. Now the sun sets after 8 p.m. 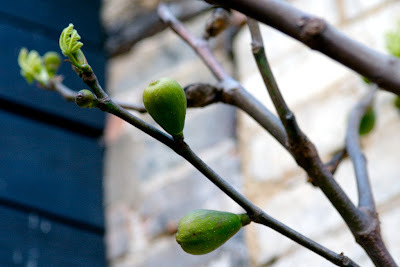 I was especially grateful for the light when, after a walk punctuated by picture-taking, I walked up to the concert venue and discovered that the tree outside its main door would seem, unless I am much mistaken, to be a fig. I thought immediately of MG's comment on yesterday's writing: the bodhi tree was a fig. And even though this one isn't quite the right kind (not a sacred fig, that is), it still figured for me as yet another revalidation in a day full of them, due in no small part to you all.